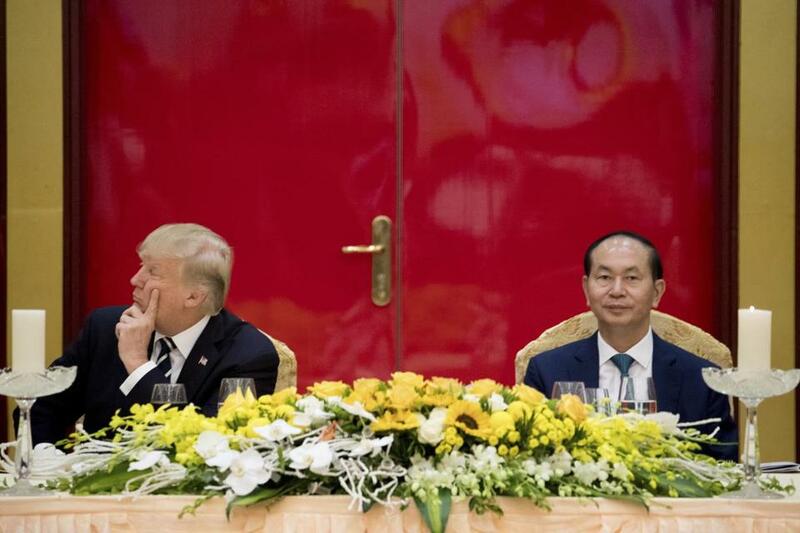 President Donald Trump and Vietnamese President Tran Dai Quang attended a State Dinner at the International Convention Center in Hanoi, Vietnam. WASHINGTON (AP) — President Donald Trump couldn’t stop talking about the red carpets, military parades and fancy dinners that were lavished upon him during state visits on his recent tour of Asia. ‘‘Magnificent,’’ he declared at one point on the trip. Last month it was Xi’s turn to literally roll out the red carpet. The Chinese leader poured on the pageantry as he welcomed Trump to Beijing on what was billed as a ‘‘state visit, plus.’’ Trump also made state visits to South Korea and Vietnam. White House press secretary Sarah Huckabee Sanders said there is no ‘‘singular reason’’ why Trump hasn’t extended a state visit invitation yet, but added that the administration hopes to schedule a visit early in 2018. Sanders gave no hints about which of Trump’s foreign counterparts are being considered for the diplomatic honor. ‘‘President Xi was enjoying it,’’ the president reported. Trump has also met at the White House, sometimes over lunch as well as abroad, with many of his foreign counterparts. He recently put the figure at more than 100. The White House portion of the visit begins with an elaborate arrival ceremony on the South Lawn, including the pomp of a military honor guard, a troop review and leader statements. The leaders meet privately in the Oval Office before they hold a joint news conference in the East Room or the Rose Garden. The evening ends with the foreign leader as the guest of honor at a lavish state dinner attended by hundreds, including members of Congress, business leaders, celebrities, political donors and others. The visiting leader also has lunch at the State Department, and sometimes will address a joint meeting of Congress. Such visits are reserved for when the U.S. wants to put on its ‘‘best face’’ for a particular leader and ally, said Peter Selfridge, who served as a liaison between the White House and visiting foreign dignitaries as U.S. chief of protocol from 2014 to January 2017. ‘‘It’s a really important arrow in a president’s quiver when it comes to the diplomatic nicety side of his work,’’ Selfridge said. And not just for American presidents. Knowing Trump enjoys flattery, Xi pulled out all the stops to impress him on that November stop in Beijing. Trump was then whisked away for a private tour of the Forbidden City that included dinner. The meal was a first for a visiting foreign leader at Beijing’s historic imperial palace since the founding of modern China. Trump also raved about an outdoor opera performance. The following morning brought another welcome ceremony at the Great Hall of the People featuring a military parade that Trump said was ‘‘magnificent.’’ He said ‘‘the world was watching’’ and claimed to have received telephone calls about it from around the world. ‘‘Nothing you can see is so beautiful,’’ Trump said. Xi also honored Trump at a state banquet that included video highlights from the Chinese leader’s visit to Florida, along with clips from Trump’s trip and the screening of a video of Trump’s granddaughter, Arabella, singing in Chinese. McBride said Trump’s decision to not extend a state visit invitation could be partly because his first year was a chaotic one, dominated by staff upheaval and lengthy negotiations with Congress over health care and tax legislation. Separately, the first lady, who is responsible for planning a state dinner down to the smallest detail, didn’t officially relocate to the White House until June. A state visit is also a massive undertaking and Trump has been running the government with a bare-bones staff. But Trump’s first state visitor will matter. ‘‘The other world leaders will pay attention to that,’’ McBride said. Not since Calvin Coolidge in the 1920s has a president ended his first year in office without hosting a foreign leader for a state visit, according to the White House Historical Association. Coolidge assumed office in 1923 after the sudden death of President Warren G. Harding, and was elected to a full term in 1924. Coolidge didn’t hold a state dinner until October 1926 for Queen Marie of Romania, according to the White House association. Every president since Coolidge has hosted at least one state visit their first year. Lyndon Johnson held 12 in 1964, his first full year in office after President John F. Kennedy’s assassination in 1963. Barack Obama, Trump’s immediate predecessor, held just one in 2009 — and it was famously crashed by a celebrity-seeking couple. Earlier this year, Trump was the special guest of President Emmanuel Macron at France’s Bastille Day parade. Trump has also accepted an invitation from Queen Elizabeth II for a state visit. Sanders said she expects those details will be announced soon.